When guitarist/keyboardist/vocalist, Joe Walsh left the band, the remaining members, Dale Peters (bass guitar and backing vocals) and Jim Fox (drums and organ) were joined by ex-Bush singer Roy Kenner and guitarist Domenic Troiano. Public reaction to the new group was mixed. At a show in Santa Monica, California, the band was pelted with eggs, tomatoes, and pennies. In October 1972 released the fifth studio album "Passin' Thru". Once again, the album featured the distinct Kenner/Troiano sound, but the songs sounded more focused and radio-ready than before. In addition, guest musicians from Nashville gave several songs a country feel. Passin' Thru sold modestly and received mixed reviews. 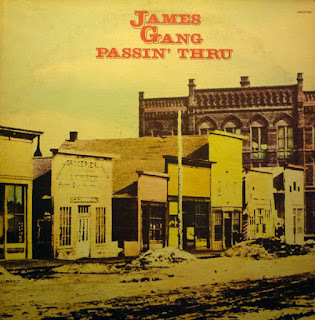 This album is the last James Gang recording featuring guitarist Domenic Troiano, who was replaced by Tommy Bolin.